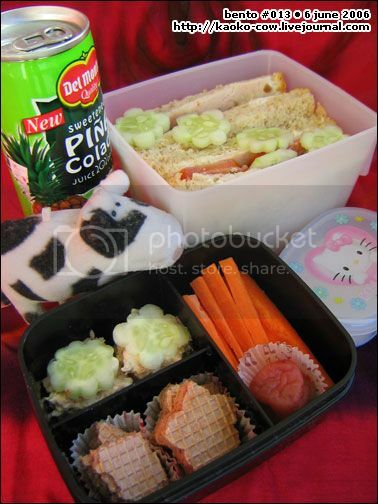 Packed a light sandwich bento today because we had tentative plans to eat out. I could always save a sandwich bento for my afternoon snack (we have a refrigerator at work) so it was all right to pack something. White Box: Mushroom Lyoner, Hungarian Salami, Tomatoes & Cucumber with Kewpie mayo on Whole Wheat. Black Box: Tuna Canapes, Carrot Sticks, Umeboshi, and Nissin Choco Wafers. Drink: Del Monte Pina Colada Juice Drink. This entry was posted in bento. Bookmark the permalink.